Error is because Atelier was launched using java from JRE not java from JDK. 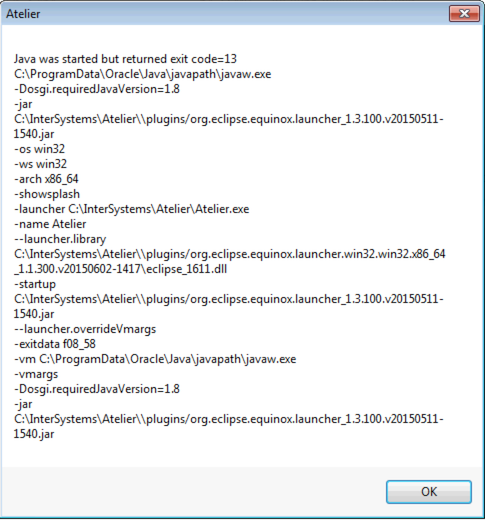 You need to have JDK and JAVA_HOME to run Eclipse/Atelier. Try installing JDK and add JAVA_HOME variable to your system and launch Atelier again. B. The bitness of Java must match the bitness of your Atelier client. I’ve seen that a 64-bit install indicates that it is 64-bit in the "java –version” output. But for a 32-bit version of Java, no bitness is listed in the "java –version” output. 2. Check your JAVA_HOME environment variable. Make sure that if this is set that it is pointing to your Java JDK/JRE with the correct version and bitness. On a Mac, you can check the location of your Java 1.8 home directory with the Terminal command: /usr/libexec/java_home -v 1.8. On a Windows machine, you can enter this in a Command Prompt: where java. Here is a screen shot running the above commands against my 64-bit java on windows. Also contrary to one of the earlier posts, I believe that a full jdk is not required to run Atelier or eclipse. A jre is sufficient. Thank you every body, with sdk 64 bit and JAVA_HOME variable created it works! It's been resolved, thank you guys! BTW, when you download Atelier installer first time on a clean machine (Mac OS 10.12.6) and run it tells that it needs java and JRE 6.0 to make Atelier work. Which is not true obviously. Can it be fixed?